Promo: The Comedy About A Bank Robbery. Nottingham Theatre Royal. 25-29 Sept. – East Midlands Theatre. Promo: The Comedy About A Bank Robbery. Nottingham Theatre Royal. 25-29 Sept. Following the phenomenal sell-out success of its multi award-winning comedy The Play That Goes Wrong, Mischief Theatre’s first UK tour of the Olivier Award nominated West End smash hit The Comedy About A Bank Robbery will visit the Theatre Royal Nottingham from Tuesday 25 to Saturday 29 September. The touring cast presents: Seán Carey as ‘Sam Monaghan’, David Coomber as ‘Neil Cooper’, Julia Frith as ‘Caprice Freeboys’, George Hannigan as ‘Everyone Else’, Liam Jeavons as ‘Mitch Ruscitti’, Damian Lynch as ‘Robin Freeboys’, Killian Macardle as ‘Officer Randal Shuck’, Yolanda Ovide as ‘Ruth Monaghan’, and Jon Trenchard as ‘Warren Slax’. With Understudies: Charlotte Duffy, Tom Hopcroft, Ashley Tucker, Ross Virgo and Eddy Westbury. 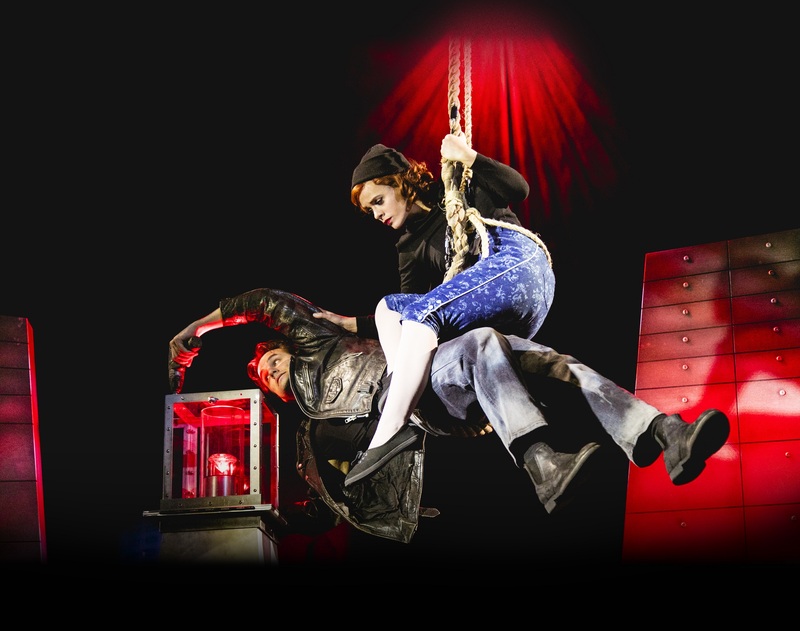 Now booking into its third year at the Criterion Theatre in London, Mischief Theatre’s smash-and-grab hit, The Comedy About A Bank Robbery, is a fast and fabulous comedy caper hailed the funniest show in the West End! Mischief Theatre was founded in 2008 by a group of graduates of The London Academy of Music and Dramatic Art (LAMDA). Starting as an improvised theatre group on the London and Edinburgh fringes, they have grown into one of the UK’s leading theatre companies, winning the Olivier Award for Best New Comedy for The Play That Goes Wrong, and licensing their productions worldwide. Mischief Theatre have two shows playing concurrently in the West End: The Play That Goes Wrong at the Duchess Theatre – also playing on Broadway and touring the UK – and The Comedy About A Bank Robbery at the Criterion Theatre. In December 2016, Mischief made their television debut on the BBC with Peter Pan Goes Wrong (Olivier Award Nominee 2016), which has also enjoyed two sell-out West End seasons. Mischief returned to BBC One in 2017 with a new Christmas special, A Christmas Carol Goes Wrong. The company is led by Artistic Director Henry Lewis and Company Director Jonathan Sayer. The Comedy About a Bank Robbery is written by Henry Lewis, Jonathan Sayer and Henry Shields. The tour is directed by Kirsty Patrick Ward. Originally directed by Mark Bell with Nancy Zamit for Mischief Theatre; Designer: David Farley; Costume Designer: Roberto Surace; Lighting Designer: David Howe; Sound Design: Jon Fiber for JollyGoodTunes; Musical Director and Arranger: Joey Hickman; Associate Musical Director: Barbara Hockaday; Resident Director: Katie-Ann McDonough. Produced by Kenny Wax Ltd and Stage Presence, in association with Birmingham Repertory Theatre presenting a Mischief Theatre Production. Promo: Casting for Nativity the musical 21- 25 November. Nottingham Theatre Royal.